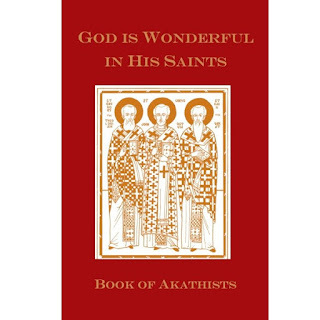 (Antiochian) - Father Michael Shanbour, pastor of Three Hierarchs Orthodox Christian Mission in Wenatchee, WA, reports that their "small mission church in Wenatchee, WA is honored to offer a beautiful, new compilation containing Akathist Hymns to thirty beloved Orthodox saints, many published for the first time (see complete list below)." God is Wonderful in His Saints is a handsome 6" x 9" hard case volume with sewn binding printed by Thomson Shore (536 pages). Each Akathist is preceded by an icon and brief life of the saint. Instructions are also provided on how to pray an Akathist. God is Wonderful in His Saints has the blessing of His Eminence Metropolitan Joseph. Bishop Basil of the Diocese of Wichita has also recommended this "very fine publication" to his Clergy Brotherhood. Order online; shipping is free!